Notwithstanding Florida’s erratic and demented weather, the time has come to usher in spring, and there are few ways more exciting to do so than by celebrating Holi. Holi is an ancient Hindu festival which celebrates the arrival of spring, as well as the triumph of good over evil. It is also well-known throughout the world as the festival of colors; hence its most vibrant practice of Holi—goers spraying each other with colored powder and water—making their targets into living canvasses of all hues. The festival has religious roots in India, but it has since become a beloved tradition across Pakistan, Bangladesh, Southeast Asia, and the UK. Traditionally, Holi does not dictate holding puja, or prayer, and in many places across the world is held to celebrate spring, love, joy, and reparations. Holi encouraged partygoers to play and laugh, meet new people, mend damaged relationships with others, and forgive old grudges and close old wounds. This is one way the festival’s spiritual origin still lives, as it encourages each person to triumph over their own inner evils. 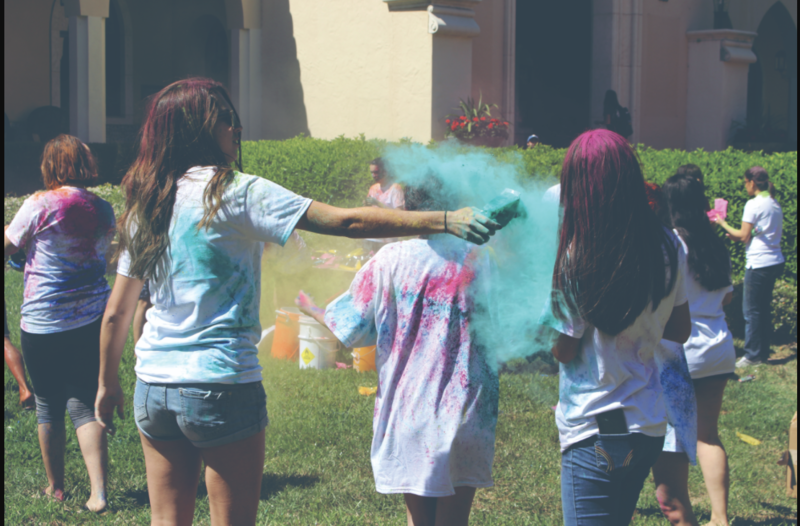 For several years, Desi has hosted Holi events on campus. The student organization promotes and celebrates Indian and Sri Lankan culture, among others. The name Desi roughly translates to “local,” as Desi is dedicated to creating community through culture. All interested students are welcome to become a part of Desi, regardless of religious or national background. The organization succeeded in bringing a joyous spirit to compus with Holi this year. Colors flew and mixed with the scent of spices wafting from the food. Desi also searched for the latest Bollywood music to fully celebrate Holi’s culture of origin. Those who enjoyed Holi should make room in November to celebrate Diwali, the Festival of Light. As its name indicates, Diwali involves lighting dozens of candles and lamps around the home and outside. The tradition honors Lakshmi, the Hindu goddess of wealth; it ushers in a year of good fortune. Diwali also involves creating intricate designs on floors out of colored rice, sand, or flower petals. Known as rangoli, these breathtaking designs are lit up using clay lamps or candles, and they are an unforgettable sight at night. The beauty of Holi, and other events organized by Desi, comes from their welcome to all. Holi asks us to promote joy, forgiveness, and goodwill towards others; what further reason would one need to attend?